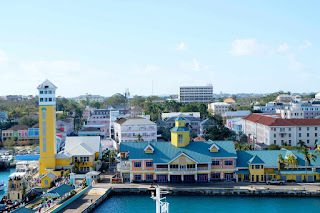 Blogs about travel, life, and everything in between. 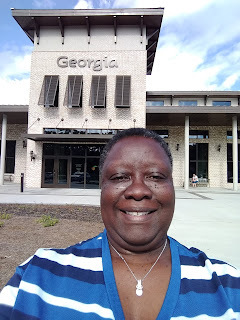 If you are interested in travel, real estate, saving money, getting finances for your business or working from home, contact me on this blog or visit www.BrendaMcMillian.com. Thanks! 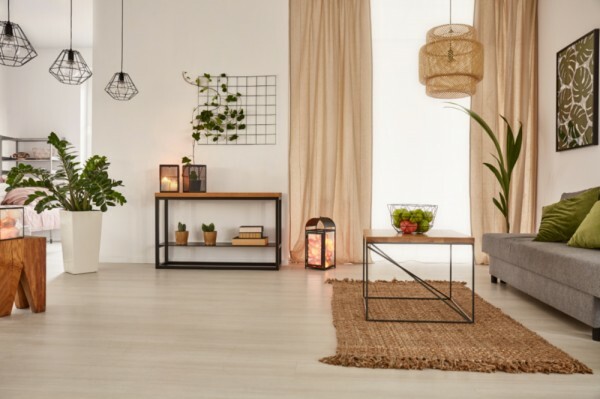 A recent survey from the National Association of Realtors® revealed that 77 percent of buyers’ agents said staging a home makes it easier for potential buyers to visual it as their own. That’s why here at Breakthrough Broker, we believe staging is not to be overlooked! Here are our top tips. Dress up your yard. First impressions count, and the first one your home gives comes from the exterior. Mow the lawn, clean up shrubbery, rake any leaves, clean the walkway and driveway, plant in-season flowers, and pull up any unsightly weeds. Reduce personal items. Make it easier for buyers to imagine themselves making your house their home by removing personal photos and knick-knacks from shelves, walls, and counters. Instead replace them with clean, simple décor, such as abstract paintings, nature images, vases, plants, and more. Organize your storage areas. Storage is a huge selling point. Tidy up and clear out the accessible closets and cupboards in the home and make sure to point them out during an open house or showing. Appeal to the senses. Consider ways you can appeal to potential home buyers’ other senses. During a viewing or open house, bake some fresh cookies or burn delicious smelling candles and play light, relaxing music in the background. Consider turning to an expert. With their knowledge of current trends and great eye for design, professionally certified stagers can transform a home in a variety of ways and have a keen sense of what home buyers want and expect in a home. Investing in hiring a pro may pay off in dividends. Are Closing Cost Tax Deductible Under the New Tax Law? What Do You Think of My Real Estate Postcard? Get Your Credit Right So You Can Get Your Home!! Isn't it time to get your credit fixed so you can enjoy home ownership? Let's get started today. Contact me at 704-727--8821 after you watch this brief video. How Do You Like My Real Estate Video? When you are ready to purchase your next home, give me a call. I operate on the 3 P's. Passionate: I love what I do! Professionalism: I am truthful and treat all with dignity and respect. Persistent: I don't stop until the job is done! My husband and I went from our home in NC to Florida for Clearwater Jazz Holiday this year. While there, I had my professional head shots done for my travel and real estate businesses and he was invited to help with the media department at the Jazz Holiday. 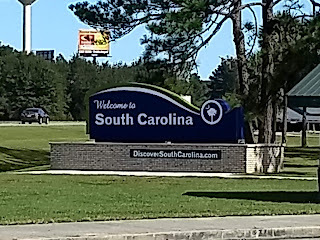 Although I had fun and met new people, I am happy to be home again. Here are some photos from out journey. 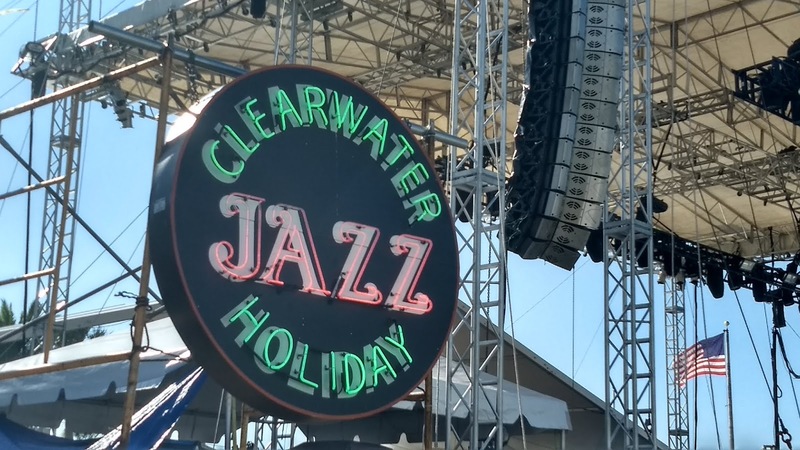 The Clearwater Jazz Holiday in Clearwater Beach, Florida is held yearly on the third weekend in October. There is an array of artists who perform. Some known locally while others are internationally known. Each year, I hear some who become instant favorites. The event is 4 days, Thursday through Sunday, of food, fun, music and meeting others who have a love for great music as well. My travel agency, McMillian Travel, would love to assist you in booking your next trip to Clearwater, or anywhere for that matter. 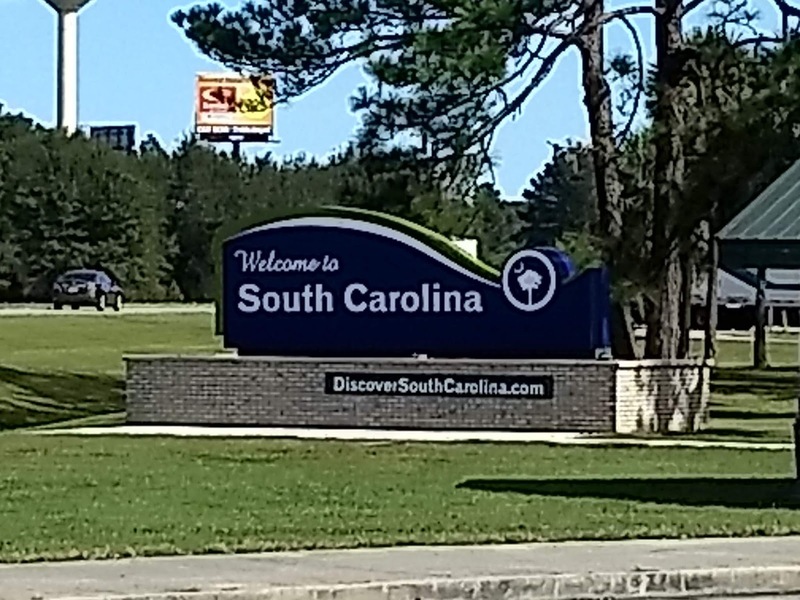 Give me a call at 704-727-8821 and start planning your next getaway today! 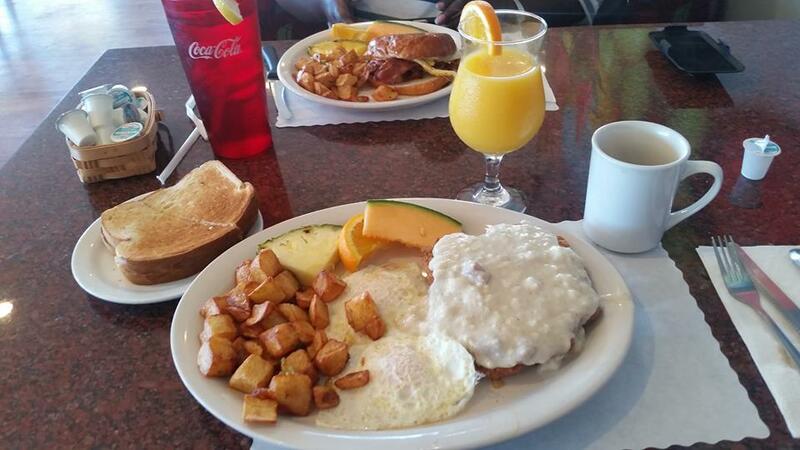 SpEGGtacular is a great place for breakfast and/or lunch. They are located at 770 S. Gulfview Blvd in Clearwater Beach, Florida. 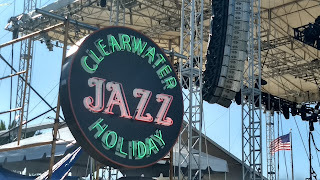 We always stop in when we are in the area for the Clearwater Jazz Holiday every year. The prices are almost as good as the food! Here are six reasons to own a home. 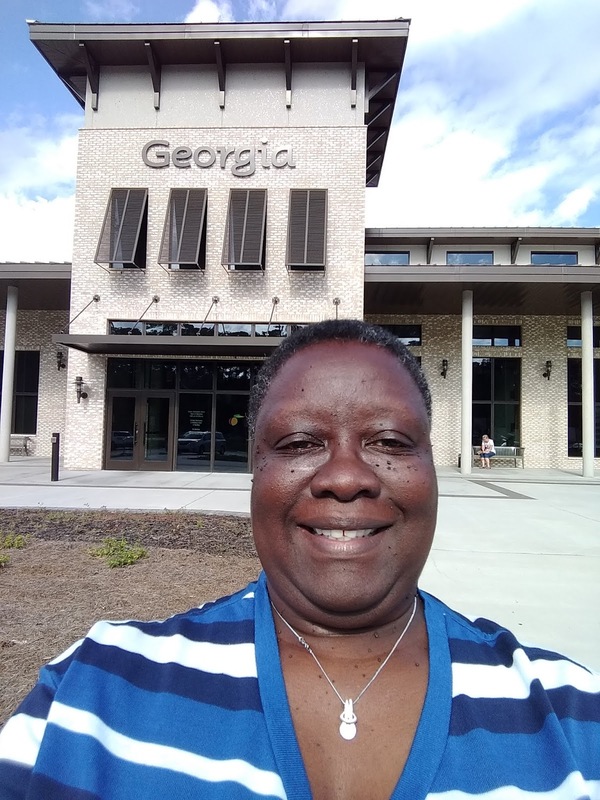 I have joined United Real Estate-Queen City and I am ready to assist you with your home buying needs. When you are ready, call me at 704-727-8821. Need a Way to Keep in Touch? 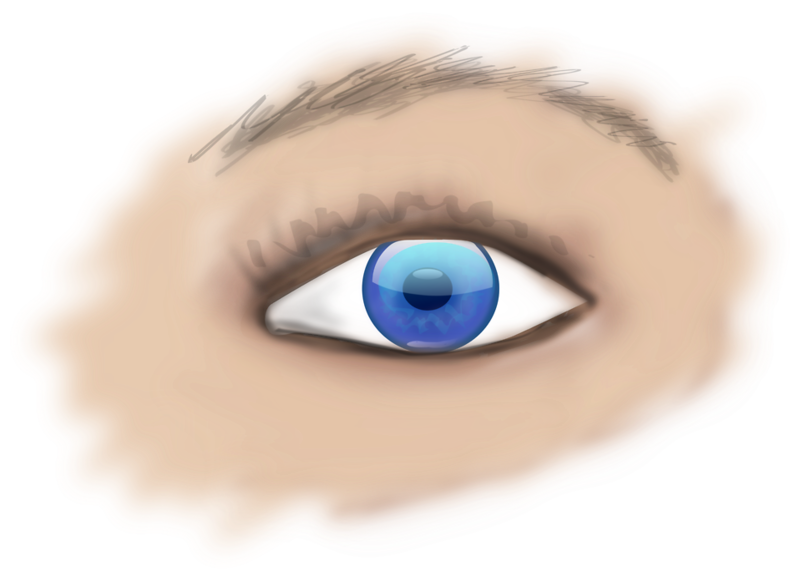 I was watching television and I heard this, "The eyes see only what the mind is prepared to comprehend." Wow! As I think of this statement it can make a lot of sense in a lot of ways. For example: If you are in a relationship and know he is cheating BUT you are not prepared to confront him about it. You are afraid that he may lie or try to make you feel bad or admit it and leave you. Whatever the case, you are not prepared to deal with any of the outcomes that could happen if you bring it up. You may somehow think that ignoring it will make it disappear. It won't! But until you are able to face it, you will continue to be angry/hurt/mad/sad. We all have things that we may not be able to comprehend at any given time in our lives. So, as you go through life, ask yourself: "What am I not facing because of a fear of the outcome?" It may make us more aware of who we are, what we want and how we are going to achieve our goals and dreams in life. Be honest with yourself. It is the only way you will allow yourself to grow and move forward in life. When you are ready to purchase your home, visit https://brendamcmillian.weebly.com/realestate.html for more details and to get started. 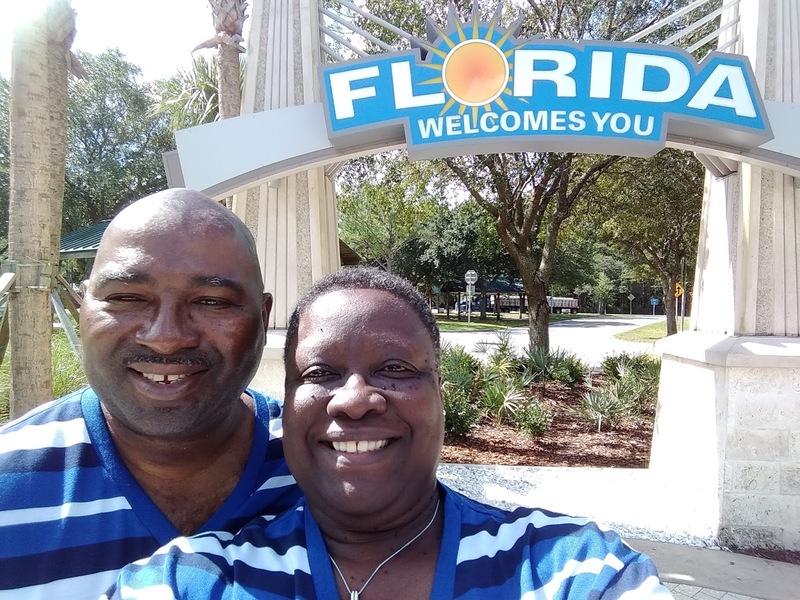 Join Mae Turner, her family and friend for her 70th birthday bash on the Carnival Ecstasy August 8-12, 2019. Don't know Mae, its OK! Go on the cruise and do your own thing! 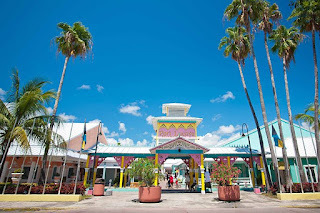 We cruise from Jacksonville, Fl and have ports of call at Nassau and Freeport, Bahamas. Click HERE for more details. 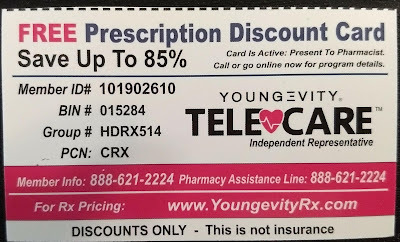 This card may help you when you visit your pharmacy. 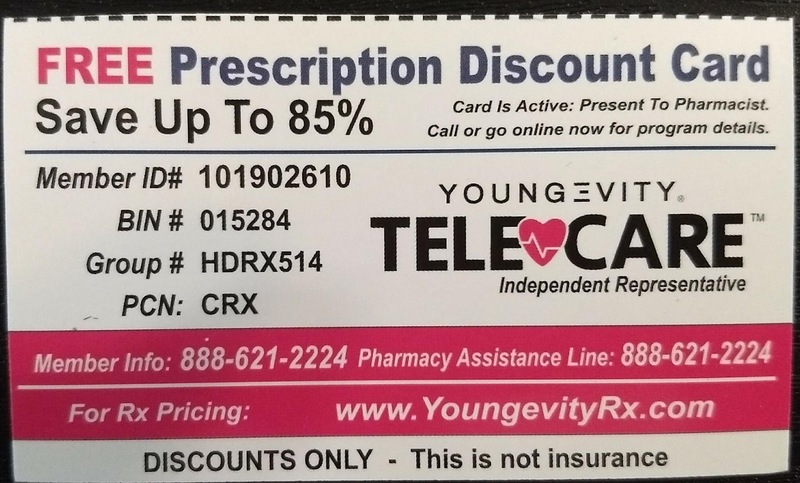 Visit the website on the card to see participating pharmacies and drugs covered. Use it as often as you like. Just take a picture and show it when you go. Contact me if you need bulk cards. Ready For A Quick Cruise Getaway? 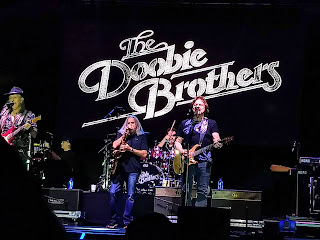 Five Day Carnival Cruise on the Elation from Jacksonville, Florida, February 11-16, 2019. Click link below for details. If You Don't Like It, Don't Knock It! I was riding the other day and an old Wilson Pickett somg came on the radio. 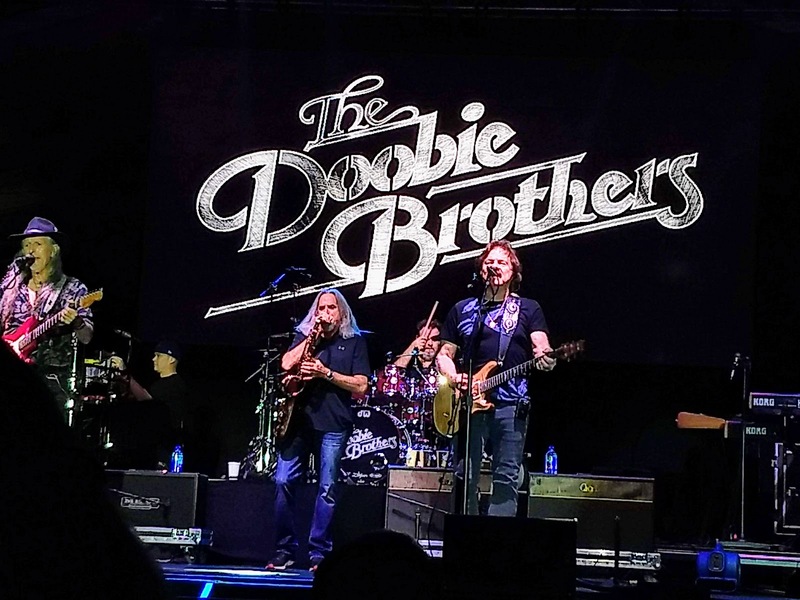 The name of the song is "Don't Knock My Love" and the chorus is ”If you don't like it, don't knock it. Somebody else might wanna rock it. If you don't need it, don't waste it, somebody else might wanna taste it." Now Mr. Pickett was singing about love bit can't we apply that in other areas of life? I was thinking about the business opportunities we are a part of and present to others. Some may want to talk badly about our business and knock it. But someone else may see the vision and wanna rock it! Then some get into our business half-heartedly and we waste it (our time) trying to get them to stay. When there are others that we should be working with or recruiting who wanna taste it (our business). So our job, then, is to distinguish between the two types of prospects and give our time and attention to those who see the vision and want to put in the work to make it happen for themselves and their family. Doing that will save us from a lot of headaches and stress. Just remember, no matter how much you push, pull or tug, a round peg does not fit in a square hole. I am always looking for ways to create income without having a job outside of the home. I came upon this one and want to share it with you. This is a simple three-step automated system that uses text messages to get your business out to others. Of course, if they do not have a business, this can be their primary one. 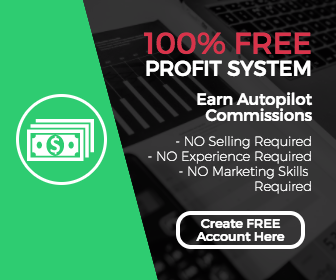 If you are not good with duplicating or with a sales pitch, let this system do the work for you. There is no monthly fee involved and you can use the system online and offline. Take a look here: http://www.sms.bamibo.com. Go and get more details and join us! I will see you on the inside. Are You Ready for a FREE, Step-by-Step Business? Click here to create your FREE account! Have You Found GDI Yet? Global Domains International is the official registry for all .WS domain names. When I began my 7-day FREE trial with GDI, I selected my own personal .WS domain name to use in conjunction with all provided services, such as hosting my own blog, website, and using truly personalized email. GDI WebMail allows me to use my own domain name as my email address and I can access my email through my account from any Internet connection in the world! Instead of using a long and hard to remember email address like mwalker554878@yahoo.com, I can use MyName@MyDomain.ws. For example you could have Sally@Smith.ws and each person in your family or business can use your domain name as well such as Bill@Smith.ws etc., up to 10 email addresses! Professionally designed by graphic artists, these WebSite templates give you the foundation for building your own personal site. There is no programming or complicated coding, simply follow the easy-to-use instructions to create a dynamic and professional WebSite! I can create my site quickly, then make changes if I’d like, or I can spend several hours creating the perfect site for myself. I also have 24/7 access to my WebSite’s control panel and can make changes at any time and as often as I’d like! I can also view the changes before I publish them to the world. For more advanced customers, one can take advantage of our hosting service. This allows me to build a site from scratch bypassing some of the user-friendly restrictions built into the previously mentioned SiteBuilder option. This allows me to build a custom WebSite just as I want it, then upload the files to GDI’s servers. Hosting gives the ultimate in flexibility! In addition to receiving awesome products, there is also an income opportunity for those who are interested! Global Domains International, Inc. is the worldwide domain name registry for all .ws (Dot WS) domain names. Our product is an incredible $10 per month package that includes your own domain name, hosting accounts, and up to ten email accounts, plus an easy-to-use online web site builder that will allow you to get a professional looking web site on the web as quickly as possible. And the best thing is, you can try out everything we have to offer, starting today, for FREE. 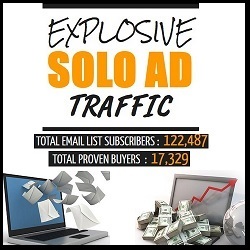 The domain industry is exploding! Industry experts predict that over 500 Million domains will be active annually within the next ten years. GDI has no competition in the network marketing industry. We are the only company that has the ability to market our domain names through the power of network marketing, and we’re willing to pay you handsomely for helping us get the word out worldwide. There are no geographical or income limits with GDI. This is our standard compensation plan that ALL affiliates qualify for, even those who are still in their free trial period. Basically, you are paid $1 per month, per domain, that is registered in your 5 level network. A uni-level compensation plan is the most simple plan in network marketing, and the key to our quick growth. You are not limited by width. You can refer as many people as you want to, and so can those people that you refer, and so on. Here’s an example. 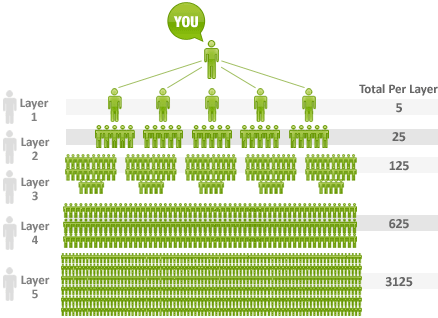 You refer 5 people to our product/program. That pays you $5 per month. No big deal? Hang on, you’ll see the power of this. Each of those 5 people then refer 5 of their own, so you’re now getting paid an additional $25 per month on your ‘second level’. Each of those 25 can refer as many as they want, but for consistency we’ll say that they too refer 5 each. That’s $125 in monthly commissions on your 3rd level. If the trend continues, you’ll have $625 in monthly commissions on your 4th level, and $3,125 in monthly commissions on your 5th level. That’s a total of over $3,900 in monthly commissions for referring 5 people, and then teaching those people how to do the same and assisting them in growing their own organizations. Keep in mind that nobody is limited in how many people they can refer. Some of our affiliates personally refer hundreds of other affiliates. Just a couple of these “go-getters” in your organization can really blow your income off the charts. Are You Ready to Start an Online Business? That can be a tricky question. Especially with all the options out there. If you have been thinking about starting your own business, this may be a good place to start. Visit my website at http://website.ws/bkam02. Get started for free! Take a look and see if it is something you want to do. After your trial period, it is only $10 a month. The earning potential is unlimited! Take a no-obligation look today! Contact me with any questions you have. I heard on the news recently that a woman got hit by a train. It immediately got me thinking, how could that happen. As I read the story, it said the woman was driving and came up to the tracks and the arms were down. She got out of her car and manually raised the arms. As she was walking back to her car, she was struck by the train. There were so many unanswered questions and perplexing thoughts that came to my mind after reading the story. The first question was, "Why was she in such a hurry?" If the arms were down, that means the train is coming! Why would you get out of your car to move the arms so you could cross the tracks? Did she think the train was not actually coming and the arms were malfunctioning? Or did she know the train was coming but reasoned she had plenty of time to cross before it got there? We will never know. What I do know is that her death was preventable. Has she just been patient and waited for the train to pass, she could have continued on to her destination. I have seen impatient people who have weaved their car through the flashing arms of a railroad crossing. And I wondered why. What's the big rush? And is getting there a few seconds earlier worth the enormous risk? I suppose to some it is. But for me, nothing is that serious for me to put my life in that type of danger. Sit there, be patient and count box cars or read an email or sing a favorite song. Life is precious and should be treated as such. Don't let anything or anyone get your mind and body in such a rush that you forget your worth. Need Sales for Your Small Business? Here is a great way to get more eyes on your product or service. And a great way to get sales! Click on the link below the banner to get started. They even have a money-back guarantee if you do not get sales! How awesome is that? Who Will Carry Our Torch? Who will carry our torch when our hands are no longer able? Who will walk the same path and uphold our dreams and build on what we have started? Will our legacy be strong in the hands of others or will the light of our torch fade because of an absence of passion or faith or caring?As we stand at the line, dreading, yet waiting to receive our torch, let's make sure we understand what we are about to recieve. Once received, please carry it respectfully, with dignity and determination and love. For one day, it will be passed along by us to others. The way we live our lives will determine if anyone else will want to receive our torch as their own and carry our legacy even further than we could ever dream. If You Want to Buy a Home, Here Are Some DONT'S! 1. Use credit cards or get behind on them. 3. Omit liabilities from your loan application. 4. Change jobs, become self-employed or quit your job. 5. Buy any large purchases on credit. 6. Originate any credit inquiries by applying for credit. 8. Deposit large sums of money without checking with your loan officer. 9. Co-sign for a loan. Any of the above actions could cause you to lose your positive loan status and not be able to get the home you want. For more information on buying your dream home, contact me, Brenda McMillian, North Carolina Real Estate Buyers Agent. I can help you with purchases within my area or anywhere in the US through my referral system. 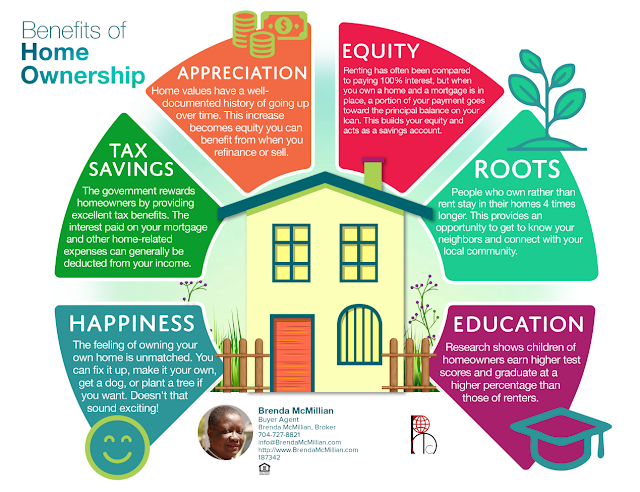 Call me at 704-294-9150 or email me at info@BrendaMcMillian.com. Every Day Should Be Celebrated! Yesterday, my husband and I took my adult nephew and his wife out to lunch. Once we were seated, the waitress asked if we were celebrating any special event. I replied, "Every day above ground is a reason for celebration!" She smiled and said she agreed but she had to ask because that is what management wanted her to do. She turned out to be very kind, efficient and thorough. We enjoyed her waiting on us and making sure we had everything we needed. 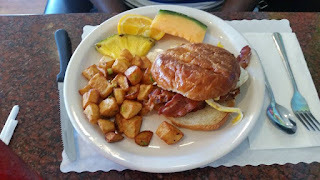 This morning, when I was thinking about our meal, I thought again about what she asked. I do always try to celebrate every day of life. The first thing I do when I wake us, is offer a prayer of thanks for seeing another day. I realize that some people did not make it to see this day and that I have another day to get my life more in order from a physical, mental and spiritual standpoint. Even when I am in severe pain, I am still thankful. Even when something weighs heavily on my mind, I am still thankful. Even when I have to supplicate Jehovah with tears, I am thankful. Each day I attempt to find something to laugh about. If I cannot laugh, I try to smile. Life can be hard and sometimes there are days I do not want to get out of bed. But after I remember my life is a blessing, I am ready to face another day. As one person once said to me, "Better to be seen than viewed." I would have to agree. I just hope that each day I am able to impart that gratitude and thankfulness on to others. It could be as simple as a smile or a quick text or a word of encouragement to a stranger. Living in continual gratitude helps me to get through the not-so-easy days and helps me to look forward to the future with love and hope in my heart. 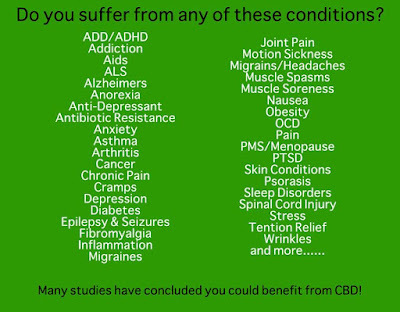 Go to http://bam1.myctfocbd.com for more information and to get started changing your future outcome! Go to http://bam1.myctfocbd.com to register to purchase at wholesale pricing. Do You Suffer From Any of These Conditions? 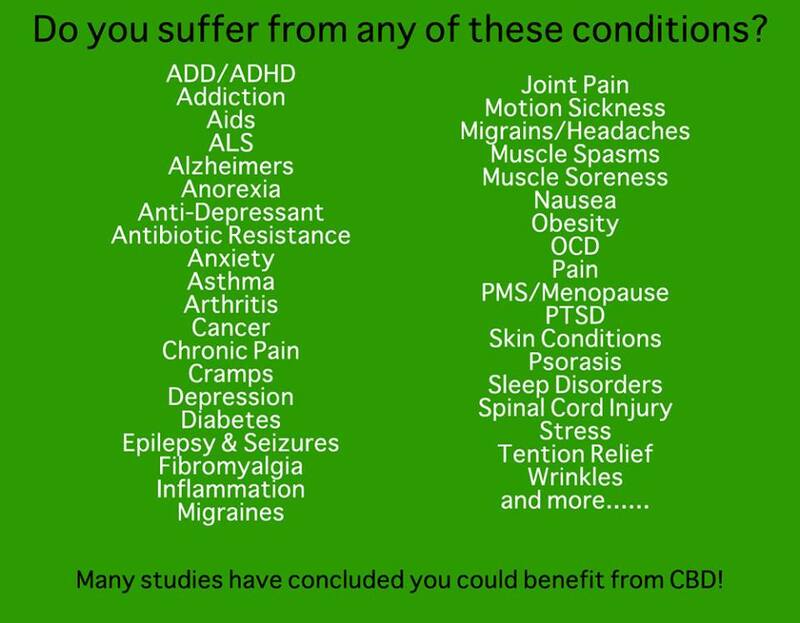 If you are interested in trying a CBD product that may help with one of the above conditions, please visit my website: http://bam1.myctfocbd.com. I am the key to your real estate needs. 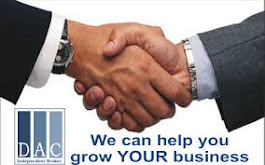 Get Financing for your Business! ©2017 Brenda McMillian. All rights reserved.. Simple theme. Powered by Blogger.